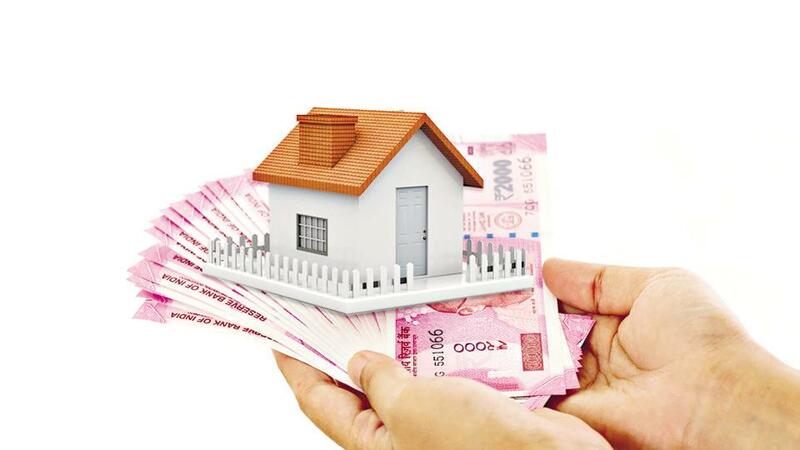 Registration of property in Gujarat, governed by the Registration Act, 1908, mandates that transactions involving any immovable property must be registered with the concerned governed body, ensuring clear and well defined transfer of titles to the rightful property owner. Complete registration of properties become a public record on permanent basis and thus clearly validates the legal ownership. Managed under the governance of Inspector General of Registration appointed by the Government of Gujarat, the process of registering an immovable property requires appropriate deed preparation and payment of necessary stamp duty and registration fees. This previously long and arduous task involving many hours of queueing and patience has now been revolutionised by the introduction of Gujarat’s own digital property registration process. Here we look at the steps to follow to register one’s property successfully, within a very short time and with ease of access. Prior to applying for property registration in Gujarat, a deed document has to be prepared. This could either be done through deed writers or by visiting the official website of Inspector General of Registration, gARVI(https://garvi.gujarat.gov.in/). Select “Model Draft” on the home page. 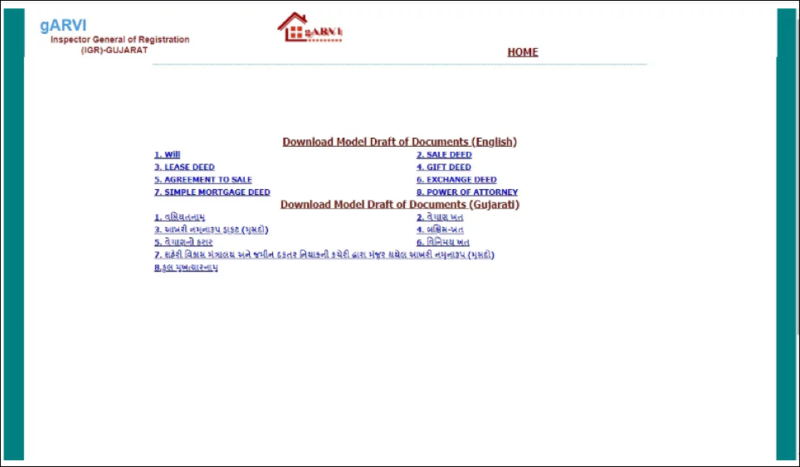 The Model Draft page enables applicant to download the required deed, basis the type of transaction involving the property. Once downloaded and filled, the deed draft documents need to be scanned in PDF format to be uploaded for online registration of property. 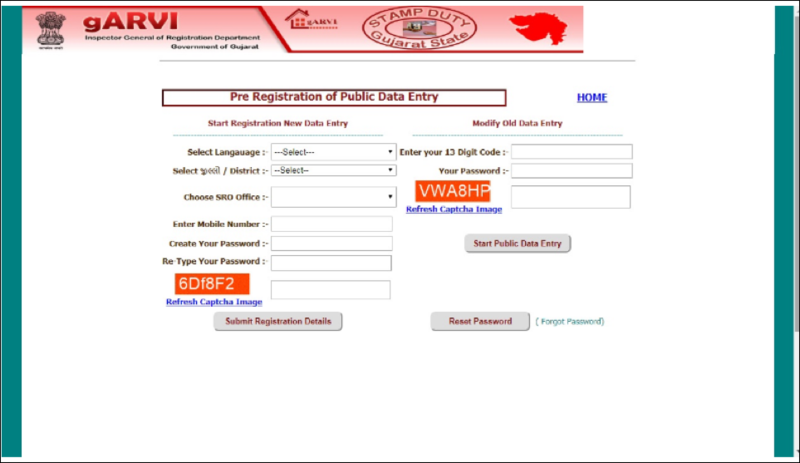 The gARVI portal has a “Public Data Entry” option to provide details required for online registration of property in Gujarat. 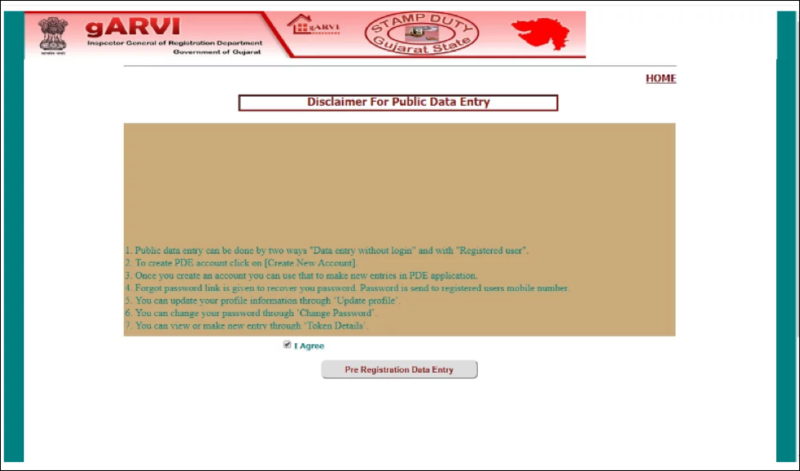 Click on “Public Data Entry” option which will be redirected to a disclaimer page. Agree to the terms provided in order to proceed with online property registration. Agreeing to the terms displays an application form for pre registration of the concerned property. This form enables an applicant to either enter new details or modify an old entry depending on their respective requirements. 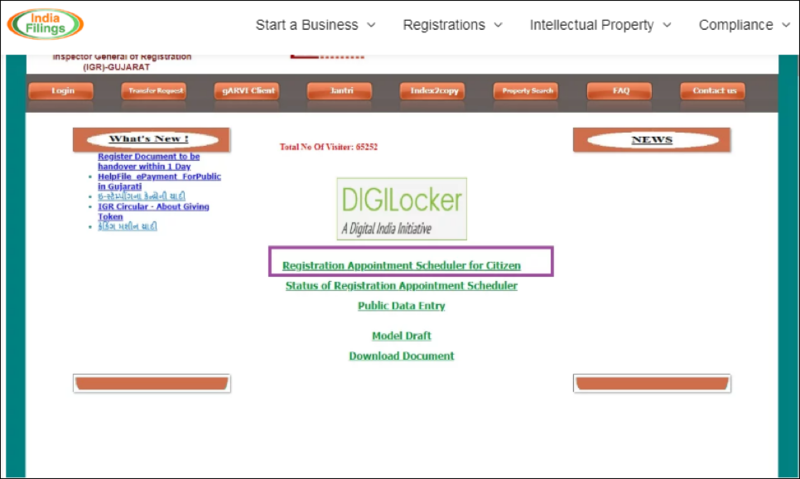 For new registrations, applicants need to select their district and SRO office available in the provided drop down menu. Applicants who wish to modify a previously entered registration need to login to the portal using a 13 digit code and password. Click on “Submit Registration Details” once necessary details have been entered and a password has been created. 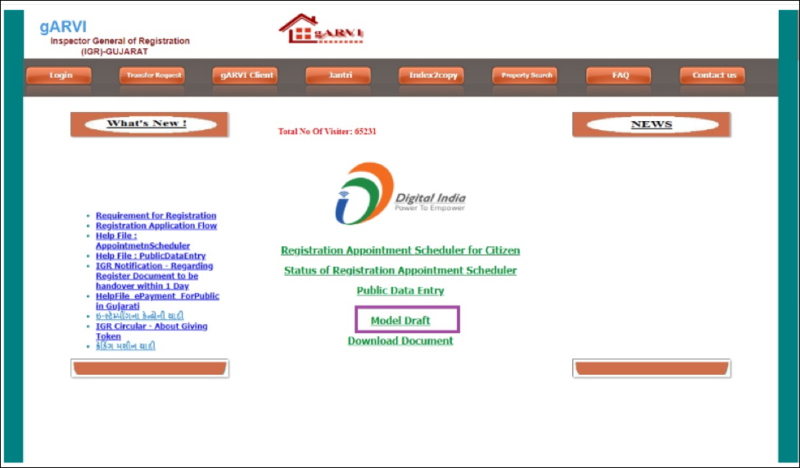 Upon successful creation of user profile, an application form for registration of the property is displayed. All available details of the documents for registration need to be entered here. Applicant can calculate the property’s market value and applicable stamp duty from the application page. 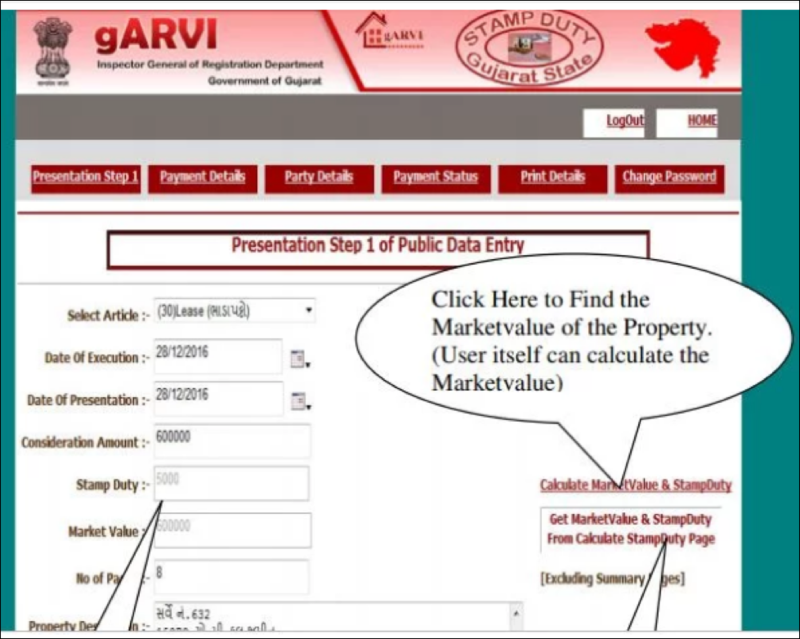 The “Get Market Value & Stamp Duty” from the “Calculate Stamp Duty” page auto- fills the calculated values on the application page. Select the “Save and Go to Next Page” option to a new window that allows applicants to select or input values as per the respective documents. Survey number, city survey number and property’s block number. 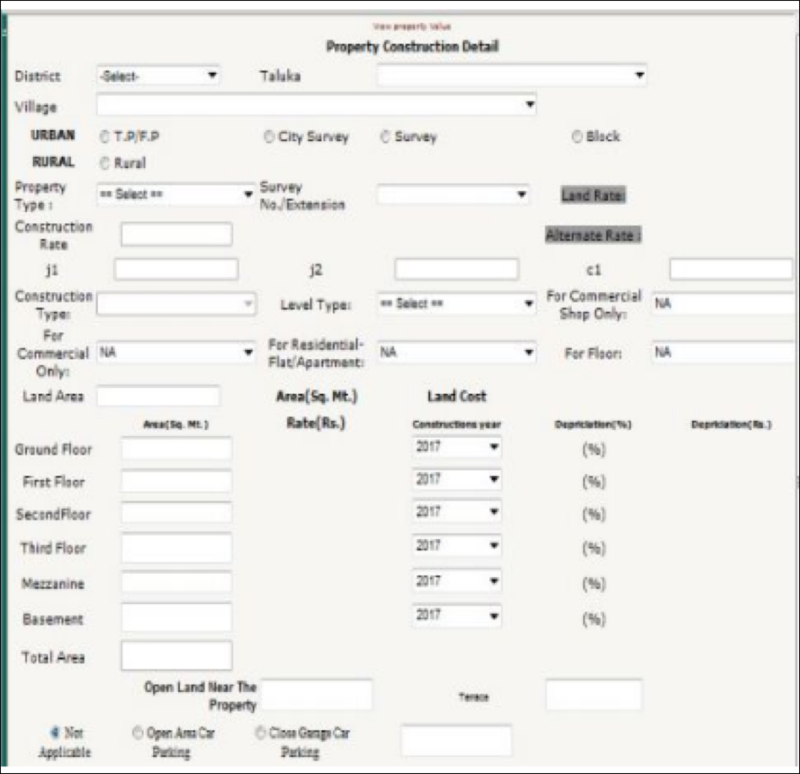 Calculate Market value to get details basis the information provided for the property. 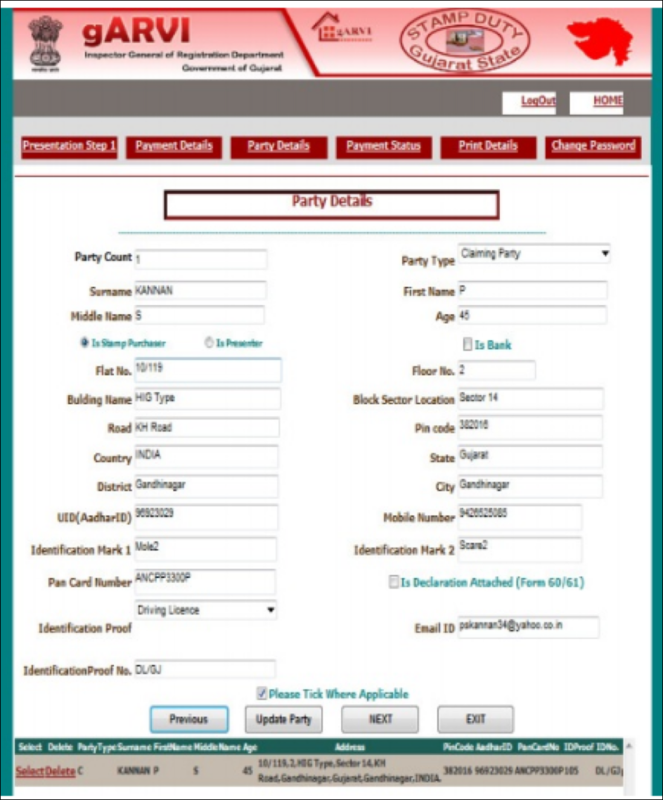 Enter details of representing parties, along with identity proof details and Aadhaar number. Enter details and select the “Next” button to proceed to payment screen. The payment processing page shows details like stamp duty and registration fees, auto filled in columns. Applicant needs to verify the amounts mentioned are in order before proceeding to the payment screen. The payment screen allows to either only pay stamp duty or registration fee or both. 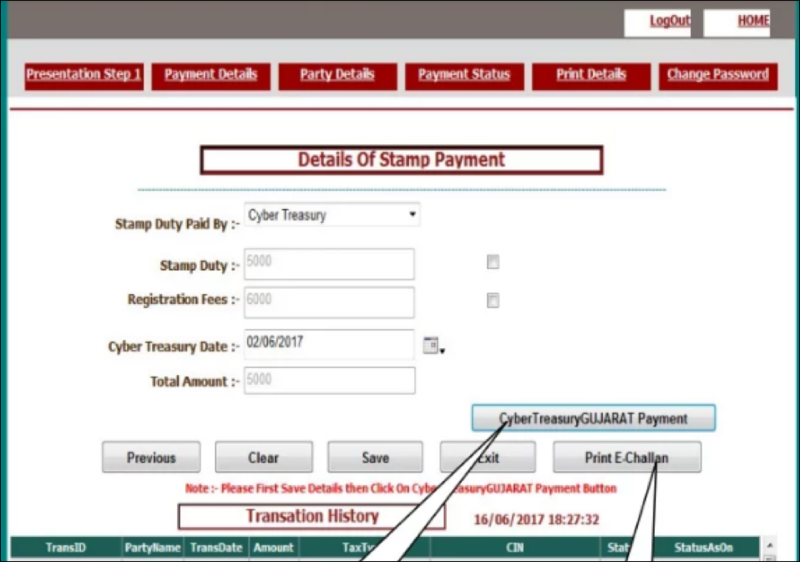 Applicant needs to select the “CyberTreasury Gujarat Payment” button to pay the necessary amount through Gujarat government’s Cyber Treasury portal. Post successful payment, a copy of the e-challan can be printed and its details provided in the application. Applicants receive a 13 digit code upon payment of stamp duty and registration fees. It is advisable to print and obtain a copy of the e-challan for future references. Once the payment is done, applicants may book an appointment at the sub registrar’s office for completing document registration. Appointments can be booked through gARVI portal’s home page by selecting the “Registration Appointment Scheduler for Citizen” option. Applicants need to provide certain details with reference to the property through the application form for booking their appointment slot. Location of property as mentioned on documents. Names and signatures of parties involved in the transaction. Post entering details, applicants need to select a convenient date for booking their slot. 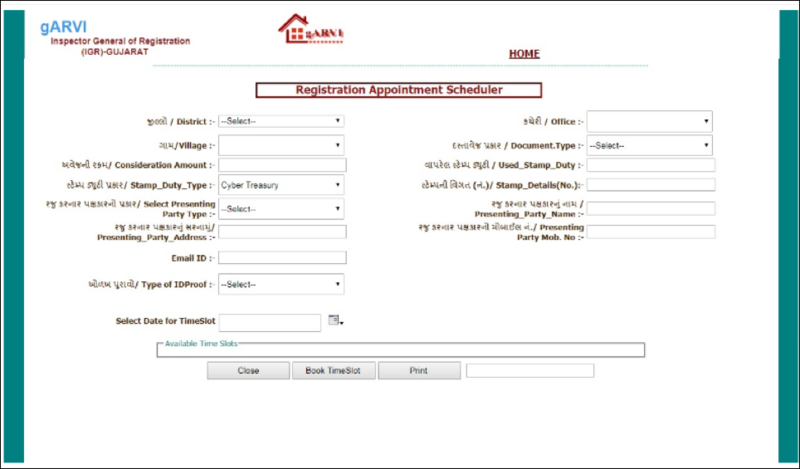 The system automatically allots the first available slot to all applicants on the selected date. Applicants can choose a slot as per their convenience from a wide range of time slots listed on the gARVI portal. Once the “Book Slot” button is clicked a new pop up displays the applicant’s scheduler ID. This ID needs to be noted by the applicant for future references. It is advisable to print a copy of the acknowledgement slip. Arriving at the sub registrar’s office on the appointed date and time ensures that post successful verification of applicants and their ID, documents and examination of stamp duty and e-challan, the office is able to update the details under Gujarat Lan Records. In case the application is rejected a due reason and concerned documents are returned to the applicants on the same day. Applicants can get the registered deed after their respective photograph and bio metrics are recorded and uploaded to the Gujarat Land Record database. The deed details are uploaded in the gARVI portal upon successful registration and can be downloaded by the concerned parties.